With Patrick Churchill at Vierville sur Mer, Normandy, on 4th June. Patrick Churchill volunteered for the Royal Marines when he was just seventeen years old. He was called up in March, 1942, just after his eighteenth birthday. He then volunteered for Special Service because “it sounded more exciting than peeling potatoes,” taking the Commando Course at Achnacarry, Scotland. Patrick served with the 2ndRoyal Marines Armoured Support Regiment and landed on Juno Beach on D-Day, 6thJune 1944. After a month fighting in the Battle of Normandy, he returned briefly to the UK and was reassigned to the 4 Army Commando. 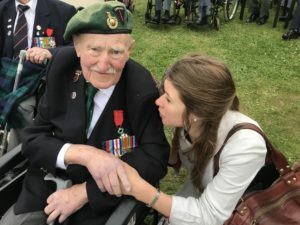 Patrick returned to Europe and participated in the liberation of Walcheren, the Netherlands, landing on Uncle Beach, Vlissingen, on 1stNovember 1944. There is a plaque in Walcheren in Patrick’s honour. Emma met Karin in Normandy in 2016. The following year, she met Patrick in Passchendaele, where he was attending the commemorations of the centenary of the Battle of Passchendaele in which his father had seen action with the Grenadier Guards. Sadly, Karin passed away last January. Patrick travelled to Normandy in June with his son, Francis. A few weeks later, he passed away. Emma will travel to England privately to sing at his funeral. Link: the story of Partick and Karin Churchill.